Anthony "Ace" Bourke and John Rendall. A LION CALLED CHRISTIAN. Collins, London / Doubleday NY 1971. Slim book (94 pages) that was resuscitated by the amazing YouTube video of the author's moving reunion with the pet lion in the wilds after a long separation. An example of a book that was suddenly desirable because of a YouTube video. It appears in Bookfinder's list of the 10 most searched for books of 2008. 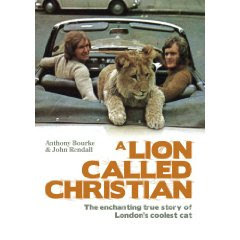 Back in Swinging London two groovy Aussies straight out of Austin Powers were living in Chelsea and decided to buy a lion cub at Harrods. They gave him the witty name of Christian and took him out to restaurants in the back of their Bentley. He never bit anybody--this was the era of peace and love. After a year, Christian had grown from 35 to 185 pounds and it was suggested by actors Bill Travers and Virginia McKenna that they take it to Kenya. They had just finished filming “Born Free,” the famous story of Elsa, a real lioness who was reintroduced to the wild. This was based on the Adamson's 1960 best seller (decent jacketed firsts £10). Soon Rendall, Bourke and Christian were all on a plane to Kenya, where they and George Adamson introduced Christian to his natural habitat. When they knew Christian had a new family and a safe territory, they went back to Europe, but kept in touch with Adamson and made a few return visits to Kenya to see Christian in the wild. Their first reunion was in early 1972, a year after Bourke and Rendall left Christian with Adamson. It is this event that is shown in the grainy colour film that has become such a sensation on YouTube. It shows the cat approaching the two men, cautiously at first. Then, as recognition begins to dawn, the lion picks up his pace and leaps into the arms of his old mates. 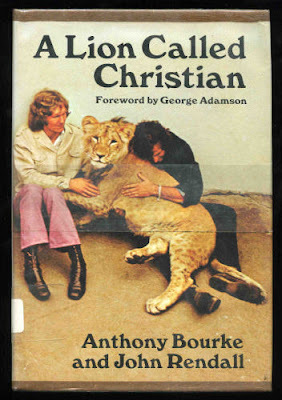 We see two young guys in flared jeans and shaggy hair, and a very large lion. When he recognises them he hugs them and tumbles with them. It is very moving with an underlying feeling of possible danger. 6 million have watched it. Two other versions of the video on YouTube have drawn another 6 million hits combined. Inevitably a few people want the book. VALUE? There are three copies on ABE at £105 (a very unpleasant ex lib reprint) £210 (a 'good' ex-lib - probably bad, an unqualified good usually means bad) and £380 (reasonable copy in chipped d/w). All seem too much for what they are, especially as the book is about to be reprinted and can be ordered at Amazon for March 2009 (pic below) at £6 -fully revised and updated by the authors. Prices tend to collapse on a reprint, e.g. an applied art book currently touted at £2K+ is about to be reprinted at £50. Caveat Emptor. Generally the new revised edition is preferred. OUTLOOK? Choppy, uncertain and probably murky. A nice signed copy of the original is probably a good investment, as always avoid ex library copies. Check out the short video here. I am stuck here in a dusty library scribbling and searching and becoming dessicated. Without your excellent (crossover) blog I would never have seen grown men hugging an enormous lion. Hatari!